To start off, I need a collection of emoticons associated with some text. And where else would I find this, but that gigantic compendium of everyday emotions, the definitive corpus of our age - Twitter. The tweet gathering process is fairly direct. I parse tweets obtained from the streaming API which contain any of a set of predefined emoticons and write them out to a file. If you want to, have a look at the Python code here. For the purpose of the R analysis, the tweet texts are already in a file. Each line is then (a) parsed for the emoticons it contains, and (b) assigned a sentiment score. 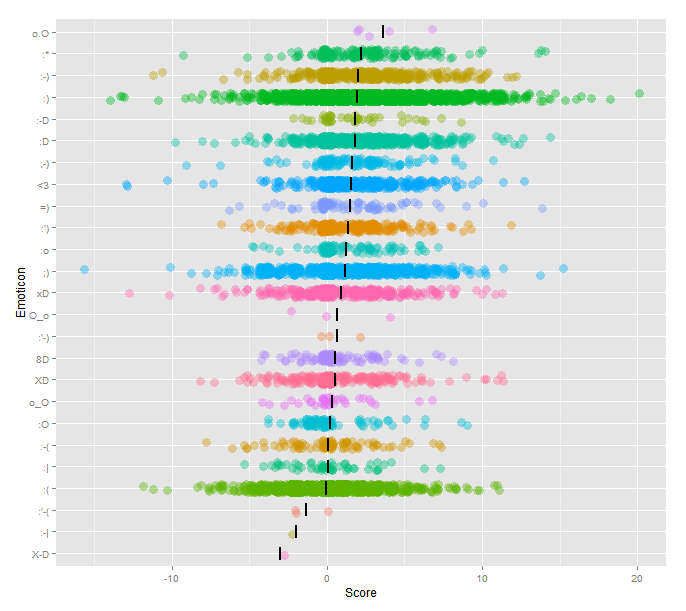 The tiny vertical black lines mark the mean score for each emoticon. There is no ordering to the colour scale. The colours just help differentiate each row. I think the ubiquity of :-) is its burden. People feel :-) for all sorts of reasons. Also, the score for o.O is computed over a much smaller number of tweets, and is possibly unstable. Thanks to Twitter's automatic url compression using t.co, it's entirely possible to see an arbitrary collection of alphanumeric characters in a tweet without any semantic information. So be wary of the scores for stuff like 8D and xD. 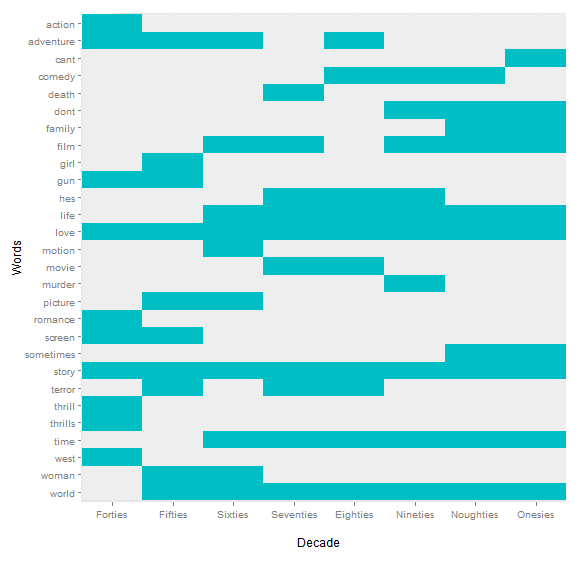 Sentiment analysis of social media content has become pretty popular of late, and a few days ago, as I lay in bed, I wondered if we could do the same thing to books - and see how sentiments vary through the story. The answer, of course, was that yes, we could. And if you’d rather just jump to an implementation you can try yourself, here’s the link: http://spark.rstudio.com/eeshan/BookSentiments. 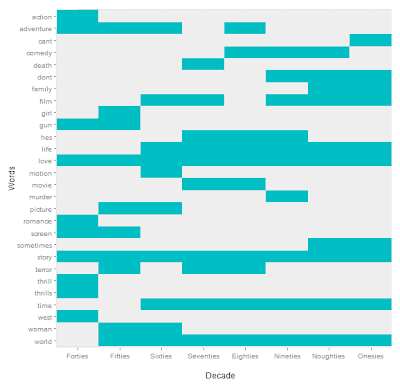 Upload a book (in plaintext format), and the variation of sentiment as you scroll through the pages is computed and plotted. The text is freely available via Project Gutenberg. The code was written in R, and deployed using the shiny package. The app itself is hosted by the generous people at RStudio. The code is available on github at https://github.com/OhLookCake/BookSentiments/, and a basic description of the functions used to generate the scores can also be found in this post. So how does the sentiment analysis really work? We use a dictionary that maps a given word to its ‘valence’ – a single integer score in the range -5 to +5. One such freely available mapping is the AFINN-111 list. Complete code available here. There's a version to run on a standalone R window, and a Shiny deployment version. Python files provide an alternative implementation. As a side note, I'd like to comment on a drawback of using a lookup table for sentiment analysis – this completely overlooks the context of a keyword (“happy” in “I am not happy” certainly has a different valence than in most other scenarios). This method cannot capture such patterns. An even more difficult task is to be able to capture sarcasm. There are a number of papers on how to capture sarcasm in text in case you're interested, but our current approach ignores these cases. Finally, there may or may not be an upcoming post on author prediction using sentiment analysis in book texts. In the meantime, do play around with the app/code and suggest improvements. OPHIRA EISENBERG: Jonathan, what's our next game? 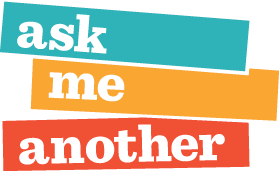 JONATHAN COULTON: Well, if you have listened to Ask Me Another before, then this game will probably sound familiar to you. It is one of my favorites. It's called This, That, or the Other. We will name an item and all you have to do is tell us which of three categories that item belongs to. Today's categories are grains, world currencies or Pokémon characters. A type of pasta, a title of an opera, or a character on The Sopranos. If you were to guess, based on what you know about how each category sounds like, would you be likely to be right more than a third of the time? Rather, could we train a model to pick up on features that are particular to each category, and then get that model to perform better than random on unseen examples? The ^ and the $ are special symbols I used to indicate beginning and the end of a word respectively. If you've worked in the field of Natural Language Processing, you'll recognize these features as analogues of unigrams and bigrams in language models. 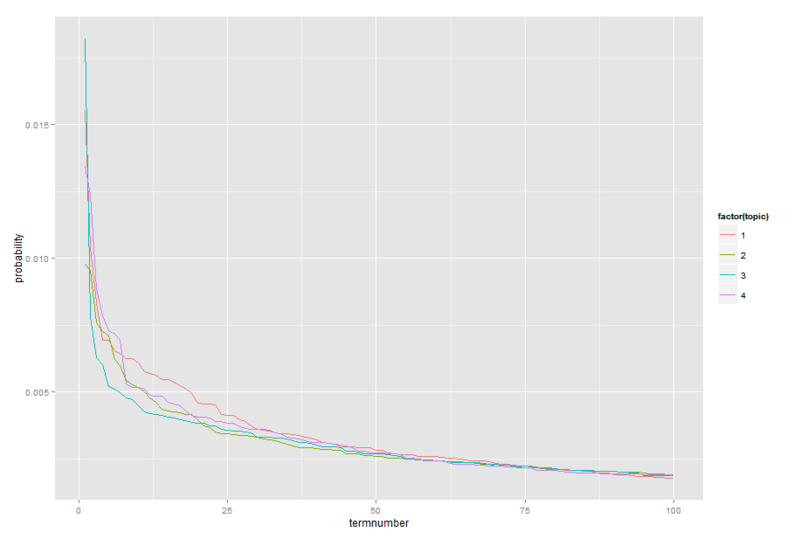 Next, I trained a Naïve Bayes model in in Python, using the excellent NLTK libraries. 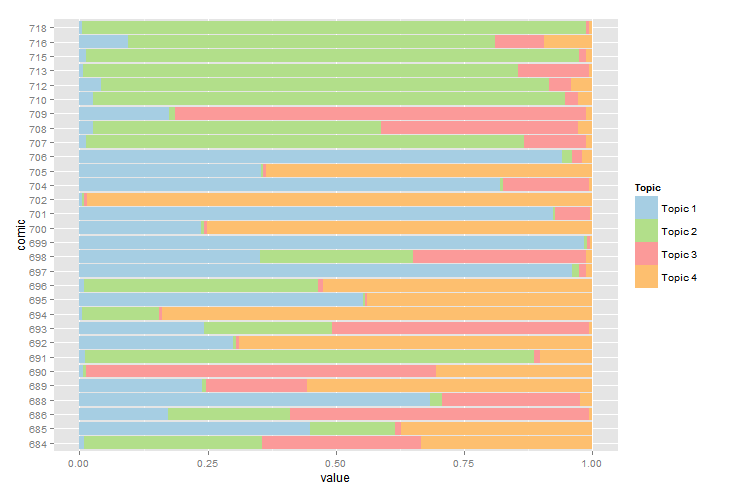 I picked categories two at a time, but Naïve Bayes allows for an extension to any number of targets very naturally. Feel free to play around with the code. You can find it on github here. With just those simple kinds of features, I was able to get upwards of 80% accuracy2 on most pairs. In fact, on a pair like Cheese vs Pasta (I would totally watch a movie with that title.(Oi! In some circles I could pass that for humour! )), which seem like a difficult pair to classify, I could get as much as 92% accuracy. Here’s a twist on the problem statement: What if you were designing the game, and wanted to pick the hardest items to guess? Actually, we can directly extend the results of the earlier part to get these. We simply need the items that the algorithm misclassified. So here’s a test to see how you do on the toughies. In the following set, can you guess if it’s a pasta, or a location in the Star Wars universe? Do well? Pat yourself on the back, for today, you have outwitted a machine. I’m working on a R + Shiny app that would make all of the above much easier for the casual browser, but it’s much more fun to play around with the code, don’t you think? Don't leave me hanging here, guys. Fine. I'll just make the app. 3 Only goes to show that there are more/better features to be derived here. 4 I was working with a slightly different version here, which included a variable for length. Don't be thrown off by that. Anyway, this post is about movie taglines - specifically, the words that constitute them. 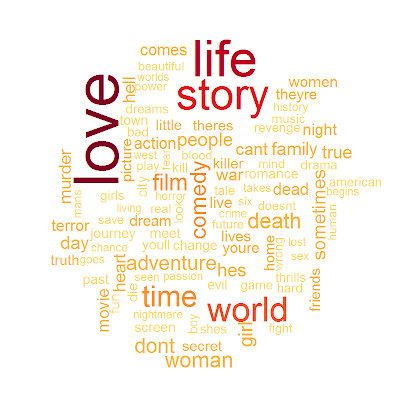 The data is pretty much there for the picking – IMDb hosts a number of freely available1 datasets, and one of them is about taglines. These numbers are way higher than I expected. 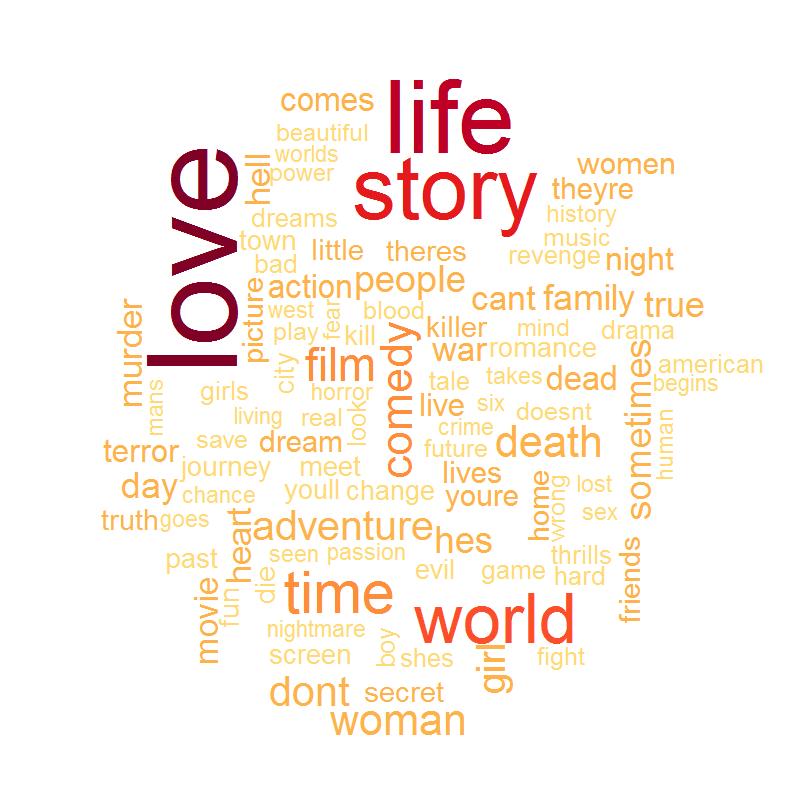 ‘Love’ alone occurs in a whopping 7.5% of all movie taglines! Yes Hollywood, we see right through you. ‘terror’ makes a comeback in the 70s; ‘adventure’ goes out. And ‘death’ is explored. The 90s are the only time ‘murder’ was cool. I've put up word clouds for each decade, and the code to generate them on imgur and github. So that’s that for frequent words. But I'm also after words that are frequent exclusively in high (or low) rated movies. Or to look at it another way, words that, in retrospect, are indicative of the movie’s success. One way of doing this is to segment the data into different parts by performance, and do the same analysis as above. But the prior frequencies will likely dominate these lists. What I really want is words whose presence (or absence) is highly indicative of the movie’s rating. NOTE: Some math to follow. If you're uncomfortable with arithmetic and/or statistics, skip a couple of paragraphs. Adding such words will not automatically make your movie successful – this is offered a post-event descriptive analysis, not a predictive one. I'm not implying any causality here. This divergence is just a magnitude - so I had to separate the most related ‘good movie’ keywords list from the ‘bad movie’ keywords list. If these lists make you have second thoughts about making Warrior Zombies from Outer Space II: Mayhem Unleashed, don't be disheartened - because like I said earlier, there is certainly a correlation, but it’s not necessarily a causal relationship5. And hey, I know a bunch of people who would watch the hell out of that movie. 2 The punctuation has been removed from the data to make the analysis easier. So if you see “cant”, that’s probably “can't”, and so on. 3 It is possible that a better metric might have been used, or even a simpler one, but for some reason, I went with this. Other suggestions are welcome. 4 IMDb ratings are arguably, not the best indicators of movie success, but that's certainly one way of estimating, and there is probably going to a future post analyzing how reliable a measure this. 5 EDIT: Revisiting this, the final two lists of words don't seem particularly robust.